Life is busy. And, it seems that sometimes it is just too busy to enjoy the things I really love, like quilting. I haven’t touched my sewing machine in way too long. I have a quilt in the works to be hand-quilted and one that just needs to be put together with backing and batting to be quilted. There just always seems to be something else more pressing to do. Ironically, that is the very reason quilting is so necessary. It soothes me, makes me happy, and keeps me somewhat sane. Recently I decided to add some color to my kitchen. More info is available about this color choice at my personal blog at CHMusings. 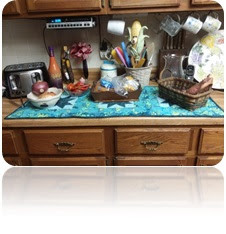 What better project for a kitchen face-lift than a new table runner? I chose my new color in the kitchen to be turquoise, so I went through my fabric stash and picked out some fabrics. I have come to love this color and enjoyed working with it. I decided to make the same table runner I have made many times before using the Double Star quilt block. I like to think of this as my signature block because I have made so many of them. The table runner consists of three blocks, joined by a strip of sashing, with a similar border all around. Rather than use my own pattern since I wasn’t quite sure where it was, and I was anxious to get started, I decided to just look for one online. Big mistake. There are several flying geese in this block and there are many different ways to make them. The pattern I downloaded used templates to cut and sew the pieces together. Have I mentioned before that I hate working with triangles? It may bear repeating. Although there was no waste involved in this method, the precision, at least for me, left much to be desired. I finished one block and was glad I didn’t cut out the pieces for all three, because I didn’t like the result. Haste does make waste. So, I decided to find the pattern I’m familiar with. I like the method, such as in this tutorial from Connecting Threads, which makes flying geese using squares sewn to rectangles and then trimming the corners. There is a bit of waste involved, but it is so worth it to have points match and end up with uniform pieces. 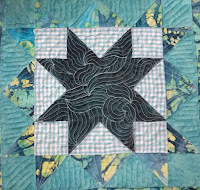 I became acquainted with this block during a Craftsy project, the 2012 Block of the Month. 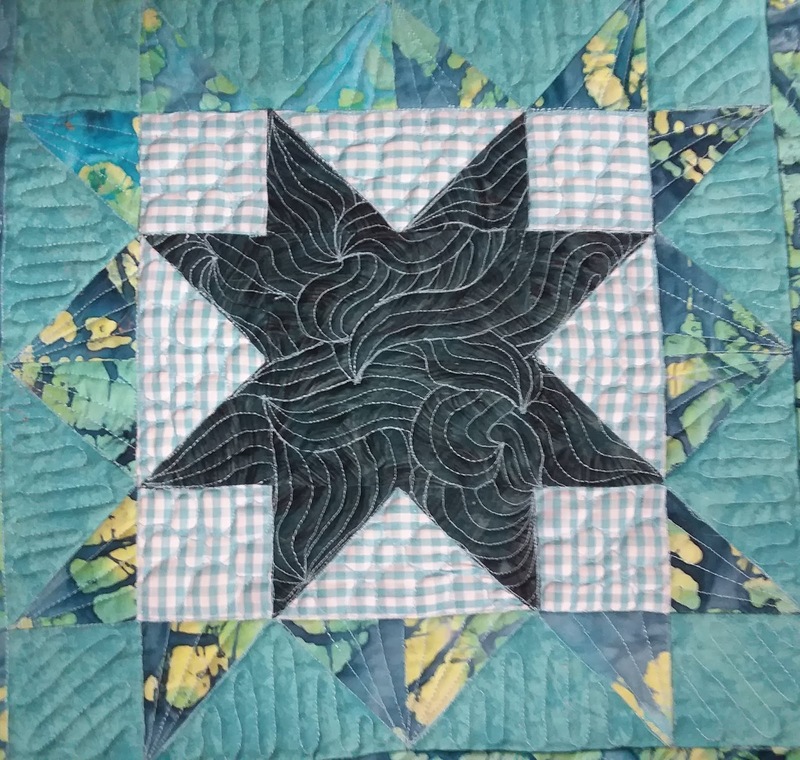 I loved making that quilt and fell in love with the Double Star. Once I found the pattern, I cut out all my pieces and began to sew them together. It went much smoother this time around. In fact, I found it all to be pretty enjoyable. It was nice to be back into the swing of it. I’ve really missed working with my sewing machine. While a little out of practice, I like how the table runner turned out. I’m pretty happy with it. It adds just the right splash of color to an ordinary drab part of my kitchen.